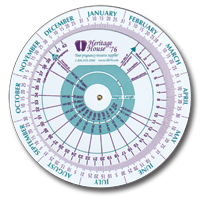 Color Pregnancy Guide and Birth Calculation Wheel. One side is full of factual up-to-date information on changes in the mother’s body and fetal development. The other side is a birth date calculator. Made from flexible plastic to last and last. Accurately predict baby’s due date. Shows the approximate size and weight of the baby at every stage.